(Rick Egan | The Salt Lake Tribune) BYU Cougar defensive back Dayan Ghanwoloku (5). Wednesday, Aug. 8, 2018. Provo • When his football-playing days are over, BYU junior safety Dayan Ghanwoloku wants to use his degree in sociology to open a private boys and girls club for underprivileged youth, perhaps in the country where he was born. The first story he will share with the youngsters is his own remarkable journey as a 5-year-old refugee from the war-torn West Africa nation of Liberia to northern Utah and then BYU, where he has emerged as one of the best players on the team and a potential NFL prospect. 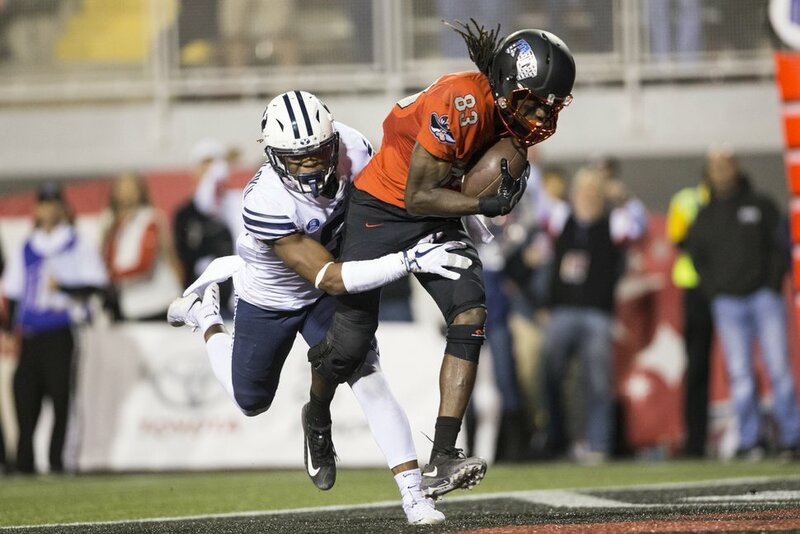 Having missed the McNeese, Washington and Utah State games while recovering from an ankle injury he sustained during BYU’s 24-21 win over Wisconsin, Ghanwoloku shined in the Cougars’ 49-23 victory over Hawaii on Oct. 13 and is ready to face Northern Illinois on Saturday. Ghanwoloku was sorely missed because he is arguably BYU’s best defensive playmaker. He recovered two fumbles in the 21-18 loss to California, for instance, and returned one 36 yards for a touchdown. Defensive coordinator Ilaisa Tuiaki said Ghanwoloku’s return was big for BYU’s defense, which struggled to stop the balanced attacks of Washington and Utah State. Ghanwoloku said he is still trying to learn the nuances of playing safety, after starting in 21 games as a cornerback his first two seasons in Provo. Doing better, and taking advantage of the opportunities that he has been given after fleeing Liberia drives Ghanwoloku every day, he said. Ghanwoloku never wants to forget his African roots, which is why he changed the name on the back of his jersey from Lake to Ghanwoloku (pronounced: GAH-WOH-low-koo) before spring camp in 2017. He said he had done it for one season while playing Little League football and did it again to honor his uncle, Gayvelor Ghanwoloku, who died in 2015. Dayan said during Photo Day in August that if Gayvelor and his father, Robert, hadn’t gotten him and his sister, Yassah, who was 7 at the time, out of Liberia that they would have been trained to fight as soldiers in a civil war that was ravaging the poverty-stricken country. The war killed more than 200,000 people. As for learning football, he says he spent hours and hours watching the NFL Network and college football games on TV. He almost quit the sport after his first Little League game because he couldn’t stand wearing a helmet and all that padding. Now he wants to take the sport to Liberia, much as former BYU star Ziggy Ansah of the Detroit Lions has done in his native African country of Ghana. “My journey is far from over,” he said. But it is off to a remarkable start.